I accidentally deleted a note. Can I recover it? I lost a note or some text from a note. What can I do? Is there a way to import my notes? Is there some way to export my notes? Can I print my notes? Can I search notes without a connection to the internet? What’s the maximum length of a note? How many notes can I make? Are my notes encrypted in storage? How much does Simplenote cost? Does Simplenote encrypt my notes during synchronization? How can I add a checklist? How can I share a note? What are the keyboard shortcuts for the Mac app? What happened to Dropbox support? If the questions below don’t answer your questions please contact us here! To reset your password, visit app.simplenote.com/forgot. Enter your email address there and a password reset link will be sent to you. Yes, all deleted notes go into your Trash. To see the notes that are in your Trash, you need to view the “Trash” tag. On iOS and Android, simply return to your main notes list and open the tags drawer. You’ll see “Trash” below the “All Notes” row. In the web app, hover over the tag in your note list, and select Trash. When viewing your Trash, you can choose to restore a previously deleted note by swiping from right to left on the note then by tapping “restore.” It will then appear back inside All Notes. In the vast majority of cases, Simplenote’s synchronization works great. We handle millions of synchronization requests each day without any problems. But if you do lose your data, even just a single character, and even if it’s not our fault, we want to hear about it. The integrity of your notes is our top priority. Any form of data loss is completely unacceptable. The first thing is to check the note history, most Simplenote apps support viewing previous versions of a note. Be sure to check the history of any blank or duplicate notes you can see. Most of the time you will find your content there. If not, you may want to check the Trash and restore the note from there. Notes put in the Trash still retain their version history. We’re in the process of adding additional safeguards and fallback measures for your notes. Please contact us regarding any form of data loss and try to provide as many details as you can remember about the circumstances that caused the problem so we can ensure it won’t happen again in the future. You can browse the notes you want to import or drag and drop a file into the import window. The app takes care of the rest. If you’re importing notes with Markdown and you’d like to keep them that way, check the Enable Markdown on all notes box and they’ll be automatically configured as a Markdown note in Simplenote. *A quick note, Mac users! To use the importer, make sure you’re using the Electron version of the app, available here. The standard version of the app available in the Mac App Store doesn’t support importing yet. You can backup your notes by exporting them from our web app. Click your email address at the top right then choose “Download .zip”. This will download a .zip file of all your notes. Each note in the .zip file will be saved as a separate text document with a machine-generated unique identifier for the note title. There isn’t a way to change the title for individual notes in the download .zip. You can also export notes in the Windows/Linux apps at File > Export Notes. The filenames for individual notes using this method is the first line of the note. Yes! You can print your notes using our web app, or any one of the applications. Open Simplenote, and click on the “Note” settings. You will see the option to Print your note using your system’s preferences. Open your note, and publish it to web. Open the link in your browser (might differ depending on your browser app), and Share the link. You will see “Print” as an option. Open your note, click on the Info in the panel, and select “Send.” You will see “Print” as an option. All notes are synced between your device, the web app, and any supported desktop apps that you might have downloaded. When you create, edit, or delete notes in any of these locations, they automatically and wirelessly synced to the other locations as well as soon as you open the app. Yes, you can search your notes even when you’re offline using Simplenote for iOS and Android as well as the Windows, Linux, and MacOS desktop apps. Searching from app.simplenote.com, however, currently requires a connection to the internet. You can create very long notes if you absolutely have to, but we don’t recommend making notes longer than several thousand words. Huge notes can take a long time to process both in the web app and on your device. We don’t currently place any restrictions on the number of notes you can make, as long as you’re not abusing the system. Unlike a lot of other services, however, by default your notes in Simplenote are always encrypted when they’re in transit across a network. This is important. It’s when your personal information is most vulnerable. We believe that all modern services should provide this level of protection by default. We respect the privacy of our users, and we’ll never give email addresses to third parties. Sign in to the web app and go to your account settings. 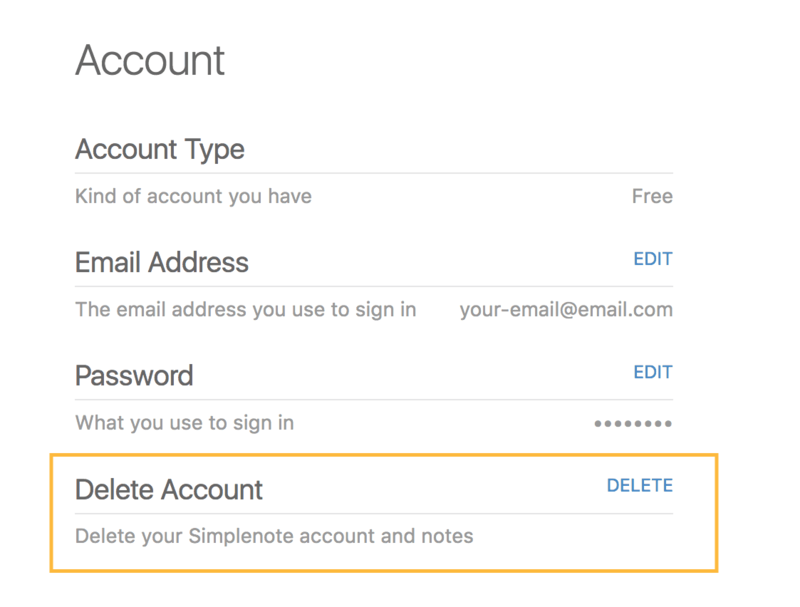 You’ll find an option there to delete your Simplenote account. Please note that all your notes will be permanently deleted, and your account details (like your email address) will be purged. If you’d like to keep a copy of your notes, we recommend you export them before closing your account. You can change your email address by visiting the Settings page in the web app. At the top, you’ll see your address along with a “change” link. Click that link and you’ll be able to enter your new address. A confirmation email will be sent to your old address. Simplenote is a free service provided by your friends at Automattic. Yes! Markdown is supported on our web app, Windows, iOS, Android, Mac and Linux. First, enable it on your note by selecting the Info panel icon and toggle the Markdown setting. Click on the Info panel icon and toggle the markdown setting. Once enabled, you can swipe left to preview your markdown notes, and swipe right to continue editing. Publishing notes is a way to share notes on the web for others to read. You can use the new info panel to publish a note to the web. Just tap the Info panel icon when viewing a note, then tap Publish. Within seconds you’ll be able to share a link to get the word out. To publish a note using the web app, click on the ellipsis icon and then click on Publish. How can I share a note or collaborate with others? If you’d like others to view and edit one of your notes, add their email address as a tag. The shared note will then pop up in their list of notes. They’ll need to have their own Simplenote account first. Similarly, if you’d like to work on a note together, have them add your email address as a tag to collaborate. On iOS and Android, instead of adding your email address as a tag, you can tap the Info panel icon when viewing a note, then tap Collaborate. If you’d like to share a view-only version, you can use the publish to web feature. You can change the language on iOS or Android by changing it from your device settings. At the moment Simplenote is not localized in Windows/Linux. Simplenote no longer supports Dropbox sync.